This easy homemade Crab Cakes recipe couldn’t be more DELICIOUS or easy! 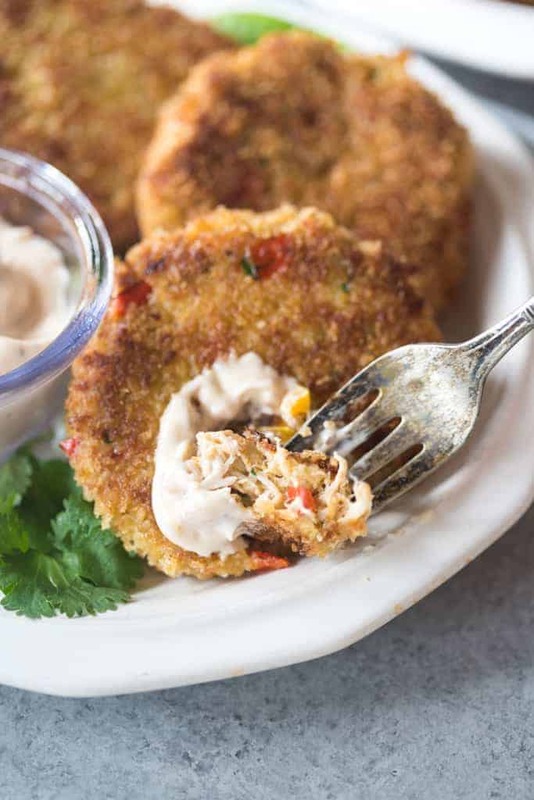 They’re made with fresh lump crab meat, diced bell pepper, cilantro, mayonnaise and spices, with an awesome crab cakes sauce. You can serve them as an appetizer or main dish. My mom made this recipe for homemade crab cakes for the first time when I was a teenager, and my family was immediately obsessed. We then went through a crab cakes “craze” where we had them really often–usually as part of Sunday dinner — and I probably took for granted how amazing they are. Once I moved out of the house it was years before I had them homemade again. Then I decided to make them for my family recently, and I was reminded how FANTASTIC they are. 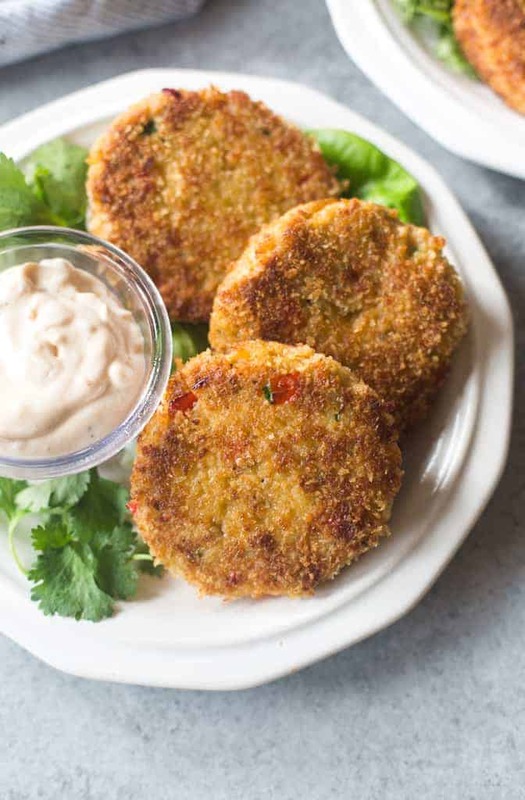 Crab cakes are small “fish cakes” that are made with lump crab meat that is mixed with various seasonings, coated in bread crumbs and lightly pan fried, baked, or broiled. 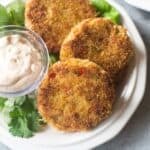 What I really love about these crab cakes, compared to other recipes, is how well the delicious crab flavor is highlighted. Most crab cake recipes have a LOT of fillers inside, like crushed crackers, chopped veggies, herbs etc. I do include diced bell peppers and some seasonings, but they are minimal and only highlight the great flavors of the crab meat. The main ingredient in crab cakes is, obviously CRAB! You want to buy good quality lump crab meat, which can be a little expensive, but the kind that comes in a can (looks like tuna fish) will NOT turn out like it’s supposed to. You get what you pay for, and these crab cakes are fantastic! Add the crab meat to a bowl and mix in the bell pepper, mayonnaise, old bay seasoning, garlic, salt and pepper. Refrigerate the mixture for at least one hour. This will make the crab cakes easier to form and hold their shape. I use a 1/3 cup measurer to scoop the crab, which will yield about 7, three inch crab cakes. You could make them smaller if you want more for an appetizer. Press the mixture firmly into your measuring cup and then invert the mixture into the palm of your hand and flatten it gently, molding it tightly with your hands to form a flat disc. Grab two shallow bowls and add 2 beaten eggs to one, and panko bread crumbs to the other. 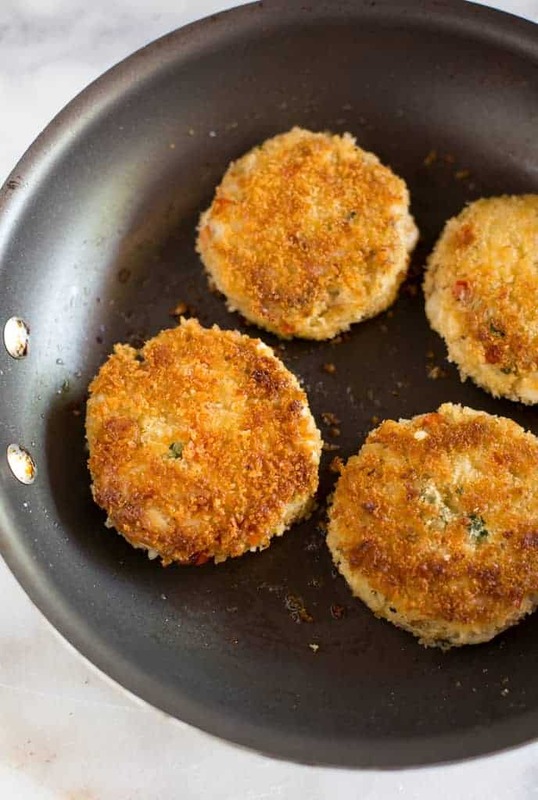 Gently sprinkle the crab cakes with cornstarch and then set them in the egg mixture, using a pastry brush to brush beaten egg over their top, and then gently transfer them to the panko breadcrumbs, using your hands to scoop and press breadcrumbs around the sides and on top of the crab cake. Heat olive oil in a large skillet over medium heat. Once hot, add the crab cakes and cook for about 3-4 minutes on each side, until golden brown. Yes, to bake crab cakes, bake them at 400 degrees for about 10 minutes. What sauce should you serve with crab cakes? Nothing takes crab cakes up a notch better than a delicious crab cakes sauce! I serve my crab cakes with chipotle mayo sauce (see recipe below). Other popular sauces to serve with crab cakes include tartar sauce, remoulade sauce, cocktail sauce and horseradish-sriracha sauce. 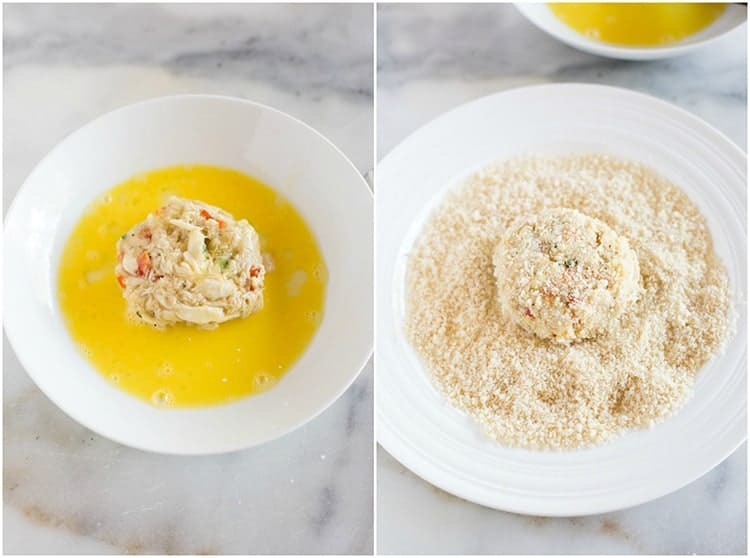 This easy homemade Crab Cakes recipe couldn't be more DELICIOUS or easy! 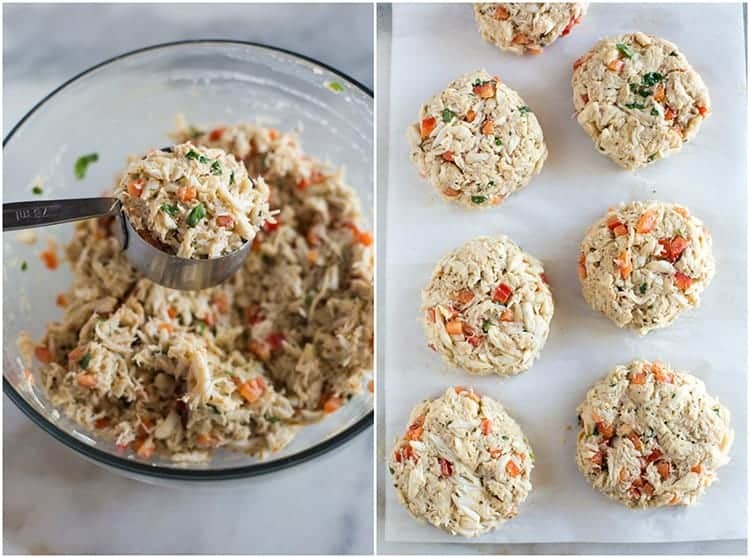 They're made with fresh lump crab meat, diced bell pepper, cilantro, mayonnaise and spices and an easy crab cakes sauce. Make chipotle mayo crab cakes sauce by combining the ingredients until smooth. Refrigerate, covered, until ready to serve. (This can be made several days in advance). 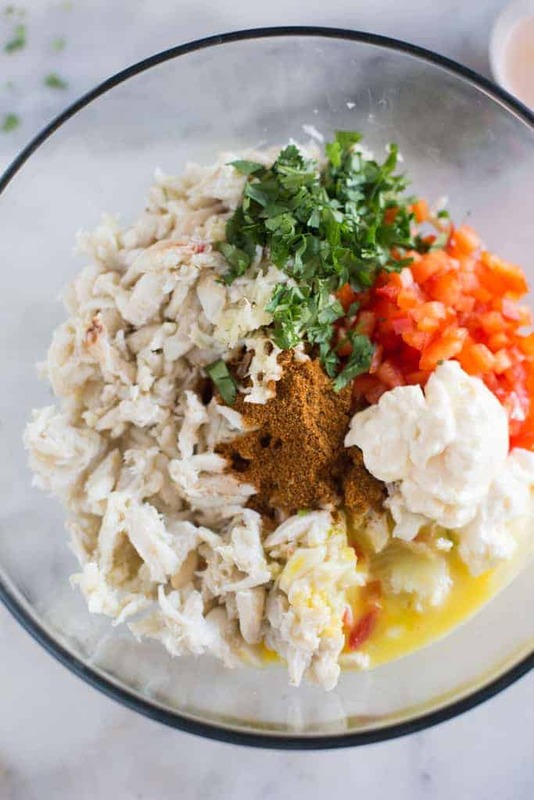 In a mixing bowl add the crab meat, bell peppers, one beaten egg, Old Bay seasoning, mayo, garlic, cilantro and salt and pepper. Gently stir just until blended. Refrigerate for at least one hour, or up to 5 hours. Beat the remaining egg and add to a shallow dish. Add the panko bread crumbs to another dish. Spoon about 1/3 of the mixture into your palm and flatten into a small disc, about 3 inches in diameter. Sprinkle the outsides of the crab cake patties with a tiny bit of cornstarch. Dip each patty lightly in the beaten egg, and then coat them lightly with panko bread crumbs. I try to avoid doing a thick coating of crumbs because I like the crab flavor to shine through as much as possible. Heat olive oil in a large skillet over medium heat. Once hot, add the crab cakes and cook for about 3-4 minutes on one side, until golden brown on bottom. Gently flip to the other side and cook for another 3 minutes, or until golden. Remove to a plate. Serve warm with chipotle mayo sauce for dipping. Made these on a whim and will definitely be making them again. The family loved them and they were super easy! Can these crab cakes be baked verses fried? They sound amazing. Yes, bake them at 400 degrees for about 10 minutes. Hope you get to try them :-). What a great recipe! Crab cakes used to always intimidate me, so I very much appreciated the step-by-step instructions and the photos. My kids loved them and my husband was very impressed. Wow! These were restaurant quality! So delicious and easy to make. Thanks for another great meal idea. Per my family, these are the best! I’m allergic to crab, but I wanted to make something special in addition to the other traditional Thanksgiving dishes and everyone LOVED them! The directions were super easy and most of the ingredients were already in my fridge (except for the lump crab – which was super easy to find at Safeway!). I fried them in Olive Oil – came out perfect!!!! So glad I found your website! This will be my GO TO for all future meals.